Studies have shown that listening to Mozart's music can affect verbal ability, spatial intelligence, creativity, intuition and memory. 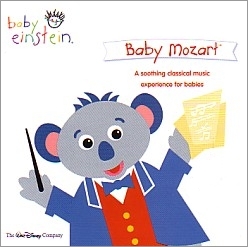 ''Baby Mozart'' was designed to be a gentle, playful introduction for infants to Mozart's music. All of the musical pieces featured on ''Baby Mozart'' were composed by Wolfgang Mozart in the 18th century. My daughter, who is now 16 months old, has listened to this cd since she was just a few months. This has become part of our bedtime ritual. My husband or I will pop this cd in, lay her in her crib and read her a book. She enjoys listening to it. But more importantly, she knows that when this music comes on, it's time for bed and that sets the tone for her. Parents will also like this cd. It's very relaxing.